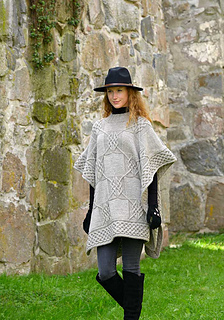 Dramatic yet easy to wear, a poncho is a perfect cover-up for the period between seasons, or with a jacket underneath, when it gets quite cold. Straight pieces and a pattern that provides some challenge. The edging with its mitered corners provides the extra touch. A wind-proof lining, attached inside the edging, will greatly enhance the wearability. 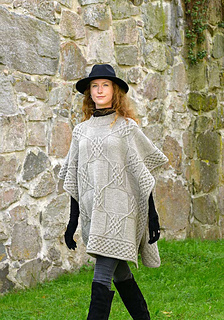 This pattern can also be used to make an afghan. 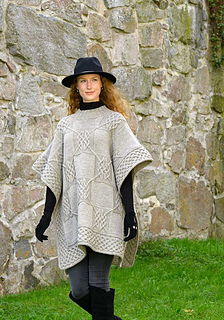 It was originally knitted in Favorite Wool, but Misty Wool works even better. 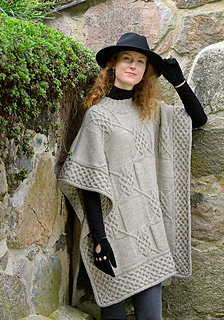 You’ll need 12 100 g skeins.